2. Hillary looked tense and stressed when I watched this on TV (Tivoed because the DNC scheduled it to happen while most Americans anywhere were at work, not home to watch). I did not expect her to photograph this well. But she still looked beautiful (as usual), and the picture is interesting. The first and most important thing to understand if you are one of the young people new to this whether via Senator Obama’s voter recruitment efforts or you are a Hillblazer, this is not the way roll calls nominate party candidates. Voting is done during prime time and might go past midnight if necessary until a candidate has the requisite number of votes. States allot the delegate votes according to commitments resulting from the state primaries the first time through the roll. It is not unusual, however, for states to pass or to yield to a state that has already been called and passed. After the first roll call, then delegates begin to shift votes. I have never seen a roll call like this one, and I have been watching since Adlai Stevenson was nominated. I was very young and impressionable. That is why it is important for young people to understand that this roll call vote was a scripted sham. Normally neither candidate would have been present on the floor. That Senator Clinton was expected to play the role she did (and did so well under the circumstances) was a violation, if not of the rules, of courtesy and respect for her privacy. She should not have been on the floor to see and hear voting going for or against her. What you witnessed was history, but of the most shameful kind in a purported democracy in a party that calls itself The Democratic Party. Hillary, once again complied with the wishes (or orders) of party leadership as a means of unifying the party. She did it graciously, with resolve and strength. That she had to be there and do that at all was insulting and abusive to a candidate who ran a genuine race. The nomination process you saw was pure theater. Now for the interesting part: The four straight-faced dudes behind her facing front, and the one looking left right behind her head are probably not delegates. From the look of them, I am thinking that they are her Secret Service detail. That makes me feel better. See, because of Bill, she continues to get Secret Service protection. It’s good to see that they were there on the floor watching her back. Another home-run by Hillary. She smiled, hit her marks, and delivered her lines like Meryl Streep. But if you believed for a minute that it was real, well there’s this beautiful bridge in her state that’s on the market…. Did it unify the party? What a question! They trashed our votes! Did they ever!!!! Our Executive Director and 1st Vice Chair of our Arkansas Democrats hit us with two sheets of paper at the Wednesday morning 7 a.m. meeting. One for Hillary and the other for Mr. Obama. We were told we had until 4 p.m. to vote so it would be counted. Many become very stressed, some crying. Even our Governor was caught totally off guard. Even after our Governor stood at the podium and said “We need to leave be in unified” and our Attorney General felt the same way – myself and 7 more of our 49 Delegates for Hillary held our ground. I did not turn my vote in until right before 4 p.m. Our Chairman, former State Senator Bill Gwatney had just been murdered 2 weeks prior to the Convention by a man who was very out of touch with reality. Bill’s sweet wife Rebecca attended the Convention to represent him. She started reading our Delegate votes – Arkansas has 49 delegates. For Obama – she was cut off there and the powers at be announced all 49 delegates voted for Barrack Obama. The WAS NOT TRUE! Arkansas had 27 of their 49 delegates to the Convention that were committed Hillary Delegates. However, after the shocker that morning – only 8 of the 27 actually cast their vote for Hillary. We kept hollering NO, NO, NO – and Rebecca sat there for the longest to properly read the information she was not allowed to share. However, the powers that be never came back to Arkansas for her to continue reading the information before her. Hillary received 75% of the votes in Arkansas in the primary. I am very proud to say I am one of the 8 of “08”. I am so proud to be a part of those who held true to their original commitment. I think the word to describe what we did is “loyalty”. Not one of our 11 Super Delegates voted for her as they had originally committed to do. All these people are my friends and even though I was so very disappointed in those who had committed but changed and voted for Barrack Obama, I know each one had a battle with their self in their decision to not support Hillary. Thank you so much for sharing this, Jane. I have heard similar stories from other states, but none is as sad as this one because of the tragedy of Bill Gwatney’s murder and the way his wife was treated by this party and this convention. I don’t know if you know this, but because this “roll call” was held when most people were at work many of us set our DVRs to record it. Nancy Pelosi began the vote earlier than the CSPAN broadcast was set to begin. When I got home to watch it, the roll call was at California. I had missed the A states and did not get to see what you described. I believe, and no one will ever shake me of this belief, that the vote began approximately 10-15 minutes before the broadcast because Nancy Pelosi did not want Arkansas’s vote to be televised and recorded for posterity. I thank you again for sharing this here, for bearing witness. I had hidden this blog post when Hillary accepted SOS because I did not want anything to reflect negatively on her when the anti-Hillary people began surfing the internet for ways to interfere with her confirmation. I am glad I put it back up. Thank you for sharing your story, Jane. And thank you, Still, for putting this post back up. 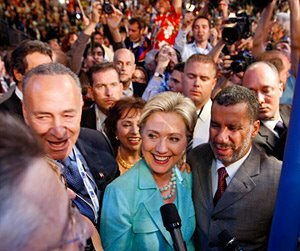 We must never forget what they did to Hillary, to her voters, and to her delegates in 2008. I will never trust these people again! Never!!!! !